Kick up your feet, have a beer – then recycle the can. Ft. Collins, CO, March 7, 2012 – New Belgium Brewing (www.newbelgium.com) is pleased to announce that its newest year-round offering, Shift Pale Lager, will roll into markets on April 2. 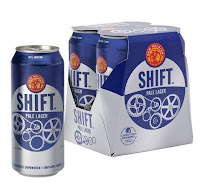 Capitalizing on New Belgium’s recently expanded can line, Shift will be available in 16-ounce cans only. In addition, the four-pack cartons are 100 percent recycled content. The beer’s name evokes New Belgium’s tradition of sharing a shift beer at the end of the day to celebrate a job well done. Shift Pale Lager features the newly developed Nelson Sauvin hop, which brings forth elements of citrus and soft fruit alongside specialty malts and lager yeast. Easy to drink, crisp and congratulatory, Shift is ready for a responsible session in the backyard and beyond. Alcohol by volume is 5 percent. New Belgium has created a downloadable app that allows users to set a Shift Beer time and announce a clock-out to friends on Facebook and Twitter. The “NewBelgium” app is available for Android and iPhones and will continue to offer fresh content. New Belgium’s Facebook fans can also invite friends to have a Shift Beer and win weekly gear or a local Shift party (www.facebook.com/NewBelgium). Shift will be available in most New Belgium distribution areas; pricing varies by market. To find New Belgium beers in your neighborhood, use the New Belgium Libation Location tool: http://www.newbelgium.com/beer/finder.aspx. - New Belgium keeping up with demand for cans. - New Belgium goes greener with electric cars. - New Belgium to change gears with Shift Pale Lager.